Early Detection: it will save your life. 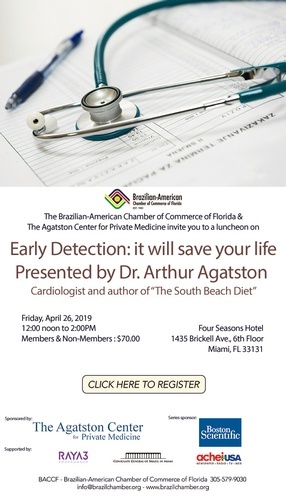 Arthur Agatston MD, FACC is a world-renowned cardiologist who along with radiologist, Warren Janowitz developed a simple CT scan screening test known as the “Agatston Score.” This simple, noninvasive test is recognized by most cardiac prevention experts as the best predictor of future heart attack or stroke as well as other chronic disease. Dr. A is also an expert in nutrition who authored the New York Times #1 best seller “South Beach Diet” in followed by 12 other nutrition, cardiac prevention and gluten related books which have sold more than 23 million copies in 33 languages worldwide. He has authored more than 200 scientific papers and abstracts. He was recognized as one of “Time 100” most influential individuals in 2004. All no-shows and uncancelled reservations are non-refundable.